IBPS Calendar 2019 released: Institute of Banking Personnel Selection (IBPS) has announced its Schedule for National & Rural Bank Recruitment Notification for 2019-20. Candidates who have been preparing for the various Bank Exams including IBPS CRP, RRB, PSB, can check the details for the forthcoming exam schedule on its official website. IBPS Calendar 2019 released: Institute of Banking Personnel Selection (IBPS) has announced its Notification and Exam Schedule for National & Rural Bank Recruitment Notification for 2019-20. Candidates who have been preparing for the various Bank Exams including IBPS CRP, RRB, PSB, can check the details for the forthcoming exam schedule on its official website. Candidates who have to be appear in the IBPS CRP, RRB, PSB Exam, can check the latest update regarding its notificatiion and all details about the Preliminary and Mains exams including Bank Clerk, Bank Probatiionary Officer and also Specialist Officer Exams. According to the calendar, Preliminary Exams for RRBs – CRP RRB-VIII (Officers) and CRP RRB-VIII (Office Assistants) exam will be will be conducted on August 3, 4, 11, 17, 18 and 25, 2019 for Officer Scale I and Office Assistants posts. For Officers Scale II & III exams, there will be single Examination to be conducted on 22 September 2019. Main Exam for the RRBs – CRP RRB-VIII (Officers) and CRP RRB-VIII (Office Assistants) will be conducted on 22 September and 29 September 2019. PSBs – CRP PO/MT-IX, CRP CLERK-IX & CRP SPL-IX examination for PO, Clerks and Specialist Officers will begin from October and continue till December 2019. 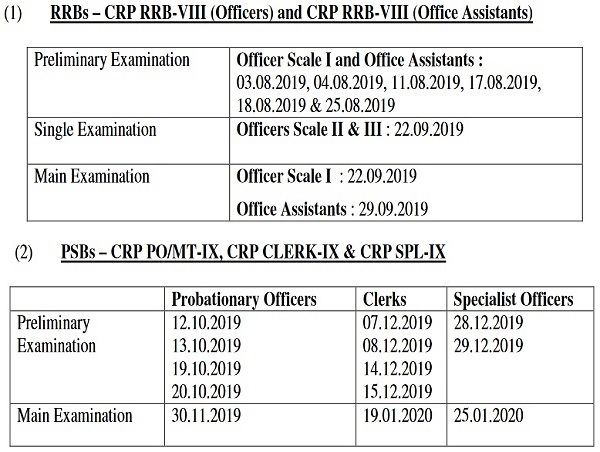 Preliminary Exam for PSBs – CRP PO/MT-IX, CRP CLERK-IX & CRP SPL-IX, Probationary Exams will be conducted on 12, 13, 19 and 20 October 2019. For Clerk Exams, tentative dates are 07, 08, 14 and 15 December 2019. Main Exams for Probationary Exam is to be conducted on 30 November 2019 whereas for Clerk Exam, it will be conducted on 19 January 2020. For Specialist Officer, Preliminary Exam will be conducted on 28 and 29 December 2019 and Main exam to be conducted on 25 January 2020. Prospective candidates are also advised to visit of ficial website of IBPS www.ibps.in regularly for detailed notification for each of the above examinations to be displayed in due course.